Welcome to Antigua at Port-of-Call! The Caribbean makes its way to Destin, Florida with this spectacular beach home. Just like the island of Antigua — you will enjoy vibrant blue waters, beautiful white beaches and delectable seafood. Antigua has been upgraded with granite counter tops, wood and tile flooring and high-end appliances. Antigua sleeps 22 guests. On the first floor, there is a huge living room that is cozy and will make you feel right at home. There is also plenty of seating for all your guest in the formal dining room which has a large table that sits up to 10 guests, in the dining room there is a small circle table that sits up to 4 guests, and there is not only one but two breakfast bars that has sits up to 6 guests. (Sits 16 Guest) That is for all our kitchen lovers, perfect for feasts with family and friends! There is an outdoor patio deck with a gas barbecue grill located right off the kitchen. A bunk room is located on this floor with two sets of custom-built queen-over-queen bunks. Additionally, there is also a bedroom with 2 queen-sized beds. A full bath with a walk-in shower completes the first level of this home. The first-floor sleeps 12 guests. On the second floor you will find a large Master King Bedroom with a private On-Suite and features a custom-built twin bunk bed nook. The private bathroom treats you like royalty with a huge garden tub and walk-in shower. This fantastic Master King Suite is finally complete with a private balcony offering you beautiful coastal views of the Gulf of Mexico. There is no better place to relax and drink your coffee with your loved one. To finish off the second floor it consist of three King On-Suites which offers each guest their own piece of privacy! There is a very spacious laundry room, a HUGE balcony that is equipped with many Adirondack chairs and a table to enjoy a nice family dinner while over looking the Gulf of Mexico. The second floor sleeps a total of 10 guest. 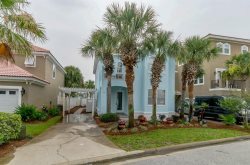 The location of this home is idyllic as it is located directly across from the popular Pompano Joe's Island Grill restaurant. Antigua is also located directly next to the community pool, where everyone can go to relax and swim. The community pool is shared by only three other homes and is never overcrowded. *This home rents from Saturday to Saturday only during Spring Break and Summer months. Please call our office if you have any questions at (850) 650-4544. This home has a beautiful gas grill. Community pool next door shared by just 3 other homes.